Last night I managed to catch the last night of 'Vacant Possession' at the Warehouse Theatre, a new comedy that arrived in Croydon direct from delighting audiences at the Edinburgh Festival by Ray Brown, performed by Phillip Manikum and Jamie Smelt. 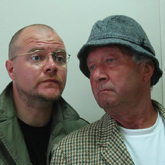 A gentle comedy, it is set in 1980s Yorkshire and deals with Sweeting, a self-made older man looking for attention and company, and Gary, a 30-something political activist and general dosser needing to move out of his mum's. There was some lovely characterisation and use of language, and it was a really sweet engaging play of the kind that works so well in the Warehouse's intimate space. The play got nice reviews at Edinburgh, but sadly Geoffrey Wilkinson who played Sweeting died suddenly before the play made it down to Croydon. Manikum has made the part his own, and it's a fitting tribute to Geoffrey that the show did go on. The play now moves on to the Hackney Empire then Yorkshire. Meanwhile the Warehouse has the world premiere of Some Kinda' Arizona this Friday, with the play on until 21 October. Tomorrow sees the start of the long-awaited inquiry into planing permission and then the compulsory purchase order being sought by Arrowcroft so that they can build their Arena scheme in central Croydon, without any viable scheme to replace the Warehouse Theatre and against the background of increasing public opposition to the scheme. Meanwhile the site owners, Stanhope Schroders, have unveiled a new name for their alternative scheme - Ruskin Square, after John Ruskin, the writer and social commentator with strong links to Croydon. Ruskin's parents are buried in Shirley and he spent much of his childhood here. Local residents and Stanhope themselves are among those who will be objecting to Arrowcroft's council-backed CPO. Although the Warehouse Theatre is pleased that Arrowcroft is slowly coming round to a replacement theatre, it too is making its objections. Arrowcroft's scheme leaves the theatre without the home for three years, then promises an entirely inadequate and unfunded building subject to stringent requirements. If they change their mind, Arrowcroft keep the three million for their own purposes - a privilege not extended to Stanhope. Ken Frost has an analysis here. The Inquiry starts tomorrow, Tuesday 17 September, at 10am at the Jury’s Hotel, 26 Wellesley Road, Croydon. At the last Croydon Council meeting, Cllr Eddy Arram (Con, Ashburton) handed in a petition of 1,500 objecting to the Conservative cut to the Warehouse Theatre grant, to cheers from the Labour councillors and the public gallery.